H.E. Hamidullah Enayad Seraj, Pcess Leyla D’Afghanistan, Pcess India D’Afghanistan and Mr. Omer Tarzi (grand children of Mahmud Tarzi) gathered in Kabul on July 17, 2004 in order to establish Mahmud Tarzi Cultural Foundation (MTCF). At the beginning of July 2004 ,necessary permission of establishment process was given by the Afghan authorities with an official letter to Mr. Omer Tarzi, via Afghan Ambassador of Turkiye, H.E. Poya Faryabi. next step…. 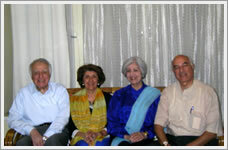 Five grandchildren of Sardar Mahmud Tarzi;H.E. Hamidullah Enayat Seraj, Pcess India d’Afghanistan, Pcess Leyla d’Afghanistan, Mr. Zaid Siddiq and Mr. Omer Tarzi gathered in Kabul, on 17th July, 2004 . Pcess India and Pcess Leyla are in the establishment committee together with Mr. Omer Tarzi. 1)On behalf of the founders, Mr.Tarzi, Pcess.India and Pcess. Leyla visited Cultural Minister Dr. Sayeed Makhdoom Rahin and made very valuable discussions with him. 2)Most important part of the work was to launch the main office of MTCF in Mahmud Tarzi High School. About this project Mr. Tarzi,and Pcess.Leyla and Pcess.India visited the Ministry of Education and met Dr. Eshraq Hossaini, deputy Minister of Education and presented this request with a letter directly to him. Mr. Tarzi explained the reason of their visit and gave detailed information about this mission. Dr.Hossaini made all necessary approvals immediately with his kind understanding and presented a letter of approval of the permission to launch the main office in Mahmud Tarzi High School, to Mr. Tarzi and sent another letter of approval to the director of Mahmud Tarzi High School. 3)In order to follow the process in the state departments, family received very kind assistance from Dr.(law) Habib Zikria who also made necessary developments and corrections on the draft in Dari. The MTCF will be launched in Kabul. All activities of MTCF will be coordinated with the Ministry of Education, Ministry of Information&Culture, Ministry of Public Health, Ministry of Planning and Foreign Affairs Ministry of Afghanistan.